Hatch is now thirteen months old. Whew…what a year 2011 was! SO many ups and downs in our wonderful city. 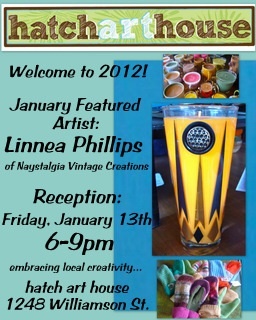 Featured artist for the month of January, is Madison artist and crafter, Linnea Phillips of “Naystalgia Vintage Creations”. Linnea’s creations all incorporate some vintage and/or upcycled materials. Most items are one-of-a-kind and everything is unique. The idea is to upcycle materials to minimize our carbon footprint. Her creations include; Candles made with vintage glassware (soy wax, all-natural), bird houses made from cigar boxes and reclaimed hardware, tote bags and children’s items made from vintage fabrics, reclaimed switchplate covers with vintage paper and mittens made from recycled sweaters. Stop in from 6-9pm Friday, January 13th… refreshments will be served!